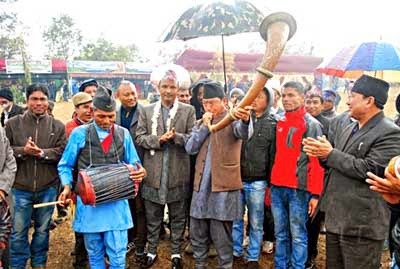 Bimal Gurung today inaugurated an agriculture and tourism festival at Meghatar near here, where it was announced that the GTA had finalised tourism projects worth more than Rs 250 crore, which includes setting up of at least eight new tourist points in the hills. The Gorkhaland Territorial Administration plans to develop Meghatar as a new tourist destination. Bimal Gurung, the chief executive of GTA who inaugurated the nine-day festival, said: "There are hardly any open spaces left in the urban areas of the hills. This makes the tourists want to visit far-flung areas, and that is why we are developing new spots." At Meghatar, the tourism department proposes to set up cottages, a lake, watchtowers and a statue of Lord Shiva at an estimated cost of Rs 13 crore. Meghatar, situated at an altitude of 5,800 feet, provides a panoramic view of Sikkim, Kalimpong and Darjeeling. "At present, we will be spending about Rs 250 crore on tourism development in the hills. Most of the projects will be completed in three years. We will only be using local materials like bamboo and wood to construct the cottages. We will not use any concrete materials," said Sonam Bhutia, the executive director of the GTA tourism department. The other new tourist spot which the GTA is working on is Nook Dhara (which is expected to cost Rs 9 crore) and Mulkhagra (expected to cost Rs 13 crore) in Kalimpong subdivision. "Mulkhagra has is a lake where one can see the reflection of Mount Kanchenjungha," said Bhutia. The other new tourism spots being developed by the GTA are cottages at Puttabong (which will cost Rs 5 crore), organic resort at Singla (expected to cost Rs 14 crore). They also plan to develop the hydel project at Sidra pong as a tourist spot at a cost of Rs 8 crore. These projects are based in Darjeeling subdivision. "We are also reviving the Old Military Road from Dilaram to Kurseong. This would be a new tourist route," said Bhutia. The road is being repaired at an estimated cost of Rs 17 crore. The other new tourism project in Kurseong subdivision will be at Belatar. "The survey for ropeways from Giddepahar to Rohini in Kurseong, Deolo to Relli in Kalimpong and Tukvar to Goke in Darjeeling is complete. We are now waiting for environment clearance," said Bhutia. The GTA is also planning to develop Mirik Lake at a cost of Rs 37 crore. "We will also develop the existing Manjushree Park in Mirik apart from developing the Tanga Road at Thurbo in Mirik," said Bhutia. GTA chief executive Bimal Gurung on Thursday laid the foundation stone for a Rs4 crore rural electrification project in 10 villages of Relling-Kaijalay constituency under the Rajiv Gandhi Gramin Vidyut Yojna. He also inaugurated a nine-day Agricultural and Tourism Festival at Maghaytar, 5km above Kaijalay, to highlight the area as a potential tourist destination. by December 15, we are targeting the Durga puja festival time,” he said. tourist hub. “The GTA will develop Maghaytar, primarily an agricultural area, into a tourist hub without disturbing its eco-system. We will invest Rs13 crore to begin with and pump in more funds as and when required,” he said. The GTA plans to lay a 5km road stretch from Kaijalay to Maghaytar at a cost of Rs4 crore. An artificial lake, boating facilities including a car parking spot are also on the cards. Cottages for visitors will also be constructed at strategic locations, and in deference of the spiritual importance of Maghaytar, the GTA will establish a statue of Krishna. “There is lot of potential here and we want to leverage this and the abundant natural resources to ensure the locals are benefited,” said Bhutia. According to the executive director, a tourist circuit from Singamari to Maghaytar is on the anvil. “A passenger ropeway service will operate from Singamari to Jamuney in the Goke area. There will be a similar service from Goke to Singla where an organic resort will be set up for overnight stays en route to Maghaytar. Tourists can then head to Rimbick and Sandhakphu. This is the circuit the GTA has drawn up,” said Bhutia.